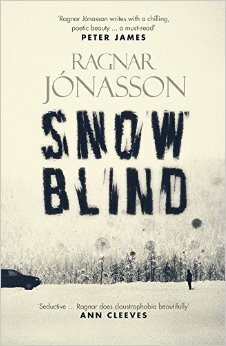 Snowblind, by Ragnar Jónasson (translated by Quentin Bates), is the first in a series of crime thrillers set in Siglufjörður, which is a small fishing town on the northern coast of Iceland. The location is claustrophobic in so many ways and this is admirably evoked in the writing. Due to its isolated position inclement weather can shut the town off for days at a time. In winter the sun stays behind the mountains and snow falls relentlessly adding to the gloom. With just over a thousand residents, many of whom have lived there for most of their lives, it appears that everyone knows everyone else’s business. The protagonist, Ari Thór Arason, arrives from Reykjavik to take up his first posting as a policeman. He parted from his girlfriend under a cloud as he had not consulted her about his new job so far away from the home they had planned to make. Having been told by his new boss, Tómas, that “Nothing ever happens here” it comes as a shock when, within a couple of months of his arrival, an elderly writer falls to his death and a young woman is found lying half-naked, bleeding and unconscious in the snow. Ari Thór is dragged into the heart of a community which harbours secrets and treats questions from strangers with suspicion. As tension mounts the young, rookie policeman struggles to cope with the unremitting snowstorms and darkness. Lonely and on edge he makes a life threatening mistake in his attempt to bring a killer to justice. There is so much about this book which I enjoyed. Ari Thór is a refreshingly believable crime fighter with his youthful errors of judgement, his struggles to fit in and to survive the oppressive environment. The plot twists and turns as the investigation uncovers a plethora of old deceits and current intrigues. Festering wounds are opened spilling secrets as dark as the days, as shocking as the blood on the suffocating snow. There are two more books promised in this series and I am now eager to read them. Although the denouement wound up this case the characters have a depth which offers more. Ragnar Jónasson has created an original voice for Nordic Noir. I would recommend that readers take a deep breath and immerse themselves in his world. My copy of this book was provided gratis by the publisher, Orenda Books. This entry was posted in Book Review and tagged crime fiction, Nordic noir, Orenda Books, Ragnar Jónasson, Siglufjörður, Snowblind, translated fiction.